Pápai Páriz Ferenc, Album amicorum p. 450. Is vel saligno navigabit vimine. Whoever sails under the auspices of God, / he may sail even in a willow basket. In Nagyenyed, on July 13, 1711. 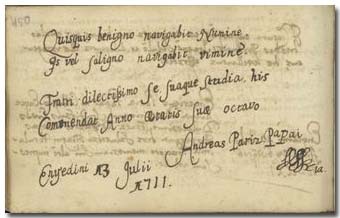 András Pápai Páriz was born in 1703 in Nagyenyed (Aiud), the son of the renowned physician, writer and professor Ferenc Pápai Páriz, Sen. (1649-1716), and of Judit Nyirő (?-1710). He was the Benjamin of his father, especially after he lost his mother at an early age. He went to higher studies (subscribed) in Nagyenyed in 1719, and then went to the university of Frankfurt an der Oder, where he graduated in medicine in 1732. Then he also studied at the universities of Leipzig and Halle. He got into bad company, and because of his debts his fatherly heritage was sold on auction at home. Later he practised in Kolozsvár (Cluj), where he became a renowned physician. He died, however, poor and lonely in 1763, leaving his books – among them those inherited from his father and his brother – and his botanical collection to the Reformed college of Cluj. His work is: Dissertatio inauguralis medica de vero et necessario medicorum arcano. Francofurti ad Viadrum, 1732. András, the eight years old schoolboy wrote in the album of his brother before this set out to abroad. Imre, their other brother wrote on the recto of the same page of the album (p. 449).